—A 259-percent climb in the number of independent dealers in its network, bringing the total to 1,500 in 39 states. —A 67-percent increase in the number of loan applications submitted to lenders through the AppOne network, including a 120-percent jump in the fourth quarter, compared to the same time frame in the previous year. —The company integrated AmeriCredit and Tidewater Motor Finance into its network, bringing the number of participating financial institutions to six, including Capital One, Crescent Bank, Trustmark Bank and Wells Fargo Auto Finance. —AppOne built strategic relationships with product providers and engaged its network of more than 250 independent agents to refer dealers to its platform. Moreover, the company reported that it increased its staff by 96 percent from 2005 and grew revenue by 87 percent from the previous year. "We continue to add independent auto dealers and lenders to AppOne's network in order to meet the tremendous growth demands for the independent auto market," explained Lee Domingue, chief executive officer of AppOne. 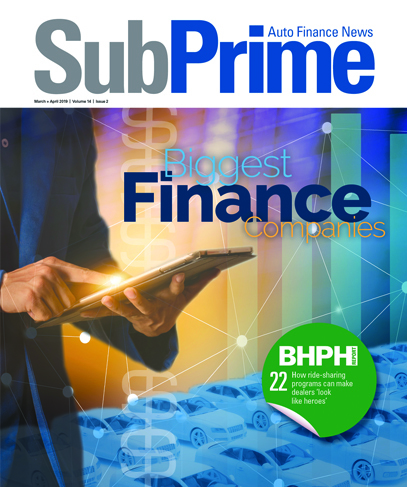 "In 2007, we will further expand our ability to enable independent auto dealers to better compete with franchise dealers and to provide a mechanism for lenders to profitably work in this underserved segment of the auto marketplace," he said. AppOne recently added a new compliance feature to its platform. The new compliance feature generates adverse action letters, which are required by federal and state regulations, including but not limited to the Fair Credit Reporting Act. In many states, if a dealership enters into a contract with a customer, or even just arranges for credit to be obtained from a financing source, the store is required by law to inform consumers of the declination of credit, according to AppOne. Moreover, dealers must offer a reason for the decision, identify the credit information source whenever an adverse action is based on a credit report and inform the consumer he has a right to receive a copy of the report, executives continued. Because this area of law is continuously changing in the courts and traditionally enforcement has been lax, AppOne said many independent dealers have not stayed current with this compliance. "Now that regulators have begun aggressively enforcing these regulations, most dealers are in danger of legal action but are unsure of their legal responsibilities," executives pointed out. In an effort to help remove the confusion, AppOne said its new feature consists of an automated module that prompts dealers to create and print a complaint adverse action notice based on loan application informed submitted by the customer. Additionally, AppOne said it has enhanced its online credit report retrieval system so that it now prompts dealers to create adverse action letters for consumers whose credit reports were retrieved but were never approved by a lender. "Many independent auto dealers unknowingly have not complied with state and federal regulations regarding adverse action letters," said Domingue. "Offering an integrated feature that seamlessly automates the production and delivery of these letters is another way in which our platform reduces potential legal risks by ensuring that all credit checks are in full compliance with state and federal regulations," he added. AppOne also recently hired Ray Anderson as the company's national sales manager. In this role, officials said Anderson is responsible for the management of all dealer sales and marketing activities for AppOne. He is in charge of building and executing sales strategies, in addition to measuring results, including cost and time effectiveness of both sales and marketing activities. Officials said Anderson's other responsibilities include training and directing business development managers, along with maintaining relationships with AppOne's alliance partners. Prior to joining AppOne, Anderson served as general manager for an auto financing provider in Dallas. He also has experience in the industry from his position as vice president of strategic alliances with AmeriCredit Financial Services, executives noted. "AppOne is pleased to have someone with Ray's experience and industry commitment to our organization," said Domingue. "Currently, Ray is further strengthening our network of independent dealers as we expand nationally. We are very pleased to have him join the AppOne team," he concluded.